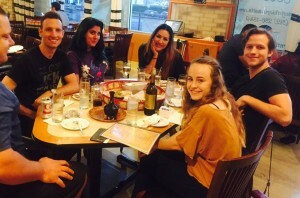 Dremana Productions Loves Team-Building Over Ethiopian Food! Home/Project/Dremana Productions Loves Team-Building Over Ethiopian Food! Uncle Bob works on the assembly line sealing those little pouches that instant oatmeal comes in. Every day at the oatmeal plant is quite predictable and Bob can pretty much plan down to the minute when he’ll be punching in, having lunch, and punching out. We are nothing like an oatmeal plant. Working at Dremana Productions is like spending a great big holiday at Grandma’s with the entire family. Regardless of what you thought walking in the door, you may find yourself learning a new card game, being in charge of basting the turkey, running to the store for onions, doing the dishes, playing flag football, hunting for extra chairs, or driving Aunt Bonnie to the hospital because her pinky finger got slammed in the car door. When it’s all said and done, everyone gets to sit down, side by side, for the feast. Even Aunt Bonnie.